Steve Pollmann, Murphy-Brown West, IA, U.S.
Is it time for a 'moneyball' revolution in pork production? 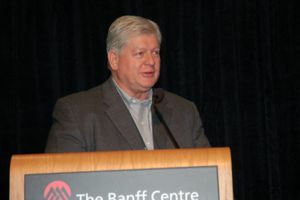 That was certainly the buzz in the room at the 2013 Banff Pork Seminar, as a division president of one of the industry's largest and most powerful players took stock of performance metrics today and where they need to go. Statistical analysis and other components of performance metrics are at a brand new level today that pork industry players would do well to adopt, says Steve Pollmann, president of Murphy Brown-West, a division of Smithfield Foods, the world's largest pork production company. That's what his company has done and it's where the world is heading. His bottom-line message: A lot of old performance measures the industry has relied upon just don't cut it in today's business environment. Pork industry players need to learn from other industries and rethink toward new and more sophisticated ways to get a true read on what works in pork production. Smithfield Foods has adopted an approach that is meant to incorporate all of the best approaches available and be regularly upgraded as new and better ways of doing things emerge. The anchor of this is a "Crossover indicator" concept the company has developed, says Pollmann. "A crossover analysis is used to help our organization make sure they focus on the things they can control, and that's productivity and controllable costs." Communication is critical and the company addresses this by capturing information on the key indicators in a scorecard format that is provided every month to each of its production segments. Feed cost is by far the largest factor in the success of a pork operation, says Pollmann. But where management decisions can really make a difference are by focusing on easier to control factors. "The mindset we have is, first, how we effectively measure the business. Then, based on that, how do we improve the business. If you focus on what counts on the measurement side, you do much better on the improvement side." Feed makes up 70 percent of the cost of an operation, he says. But producers typically need to look more closely at some of the other variable costs that are easier to manage. "That's where there's money to be made." The poultry industry is an example of where the pork industry can learn from, says Pollmann. "I admire them. They're progressive. And they've been much more effective at integration than we have in the pork industry. I think it's a good model for us to look at. There are three principle drivers of the poultry business that are very similar to the drivers in the pork business - live performance, plant performance and sales performance. There are multiple components and indicators in each area. Over the past six years, both the poultry and pork industries have seen a near identical rise in feed cost as a percent of total cost from around 50 percent to 70 percent. At the same time, chick cost and wean cost have become less critical. Over the past two decades, the poultry industry has seen a 50 percent increase in bird weights alongside a 20 percent improvement in feed efficiency. "Their principle driver really is about white meat yield," says Pollmann. "That has been one of their principle integrated values. You can see how effective they've been since at increasing white meat yields, at an annual rate of 0.44 percent." More recently that is starting to level off and brown meat is becoming more critical, with thigh meat and wing meat becoming a bigger part. Pollmann asked the BPS audience to think about how that trend pertains to the pig industry. "Ten to 15 years ago bellies to us were not nearly as critical as they are today – that meat sells at a higher price than loin meat. Today, bellies are much more critical. We sell stomach meat at the price greater than loin meat." The pig industry though, has not seen the meat yield gains and feed efficiency gains at the level of the poultry industry. Pollmann also observes that among the components of live, plant, sales and 'other,' live pork production represents significantly less of the value proposition today than it did five years ago. "Today you've got to take less money in live production. What you need to do then is still make money as an integrator - that's how you get the net effect of greater returns on investment." That's the challenge that lies ahead and identifying the best future indicators is critical to meeting it, he says. What are those future indicators? "I personally believe there will be more focus on integrated indicators, much like the poultry industry. And for us to be more successful, that needs to be tied to that bottom line." The industry also needs to make better use of benchmarking results. "What that does is bring common definition. You can have better internal benchmarking. This also gives you a chance to see how you stack up with others and what you need to improve to get to world class status in your operations. Bridging the communications gap between production people and financial people is another challenge to meet, says Pollmann. "I also think the accountants and finance people don't understand statistics as well as we need them to. So the challenge is to increase the use of statistical process control and statistics to improve the running of progressive businesses." At the end of the day, a huge factor for industry success will also be adopting a progressive, forward-looking stance, he says. "We've got to get away from the whole concept of looking in the rearview mirror at where we've been. We need to spend more time looking at items that are highly correlated to key business measures so that we can be more responsive to changes in our industry."